The Indicia2Recorder addin is an extension to Recorder 6 which allows download of the records you have access to from an Indicia powered online recording website. The addin depends on modules existing on the website which are currently only available for Drupal, this means that the addin can only download Indicia records via a Drupal 7 or Drupal 8 website such as iRecord at present (Drupal 6 is possible but no longer supported). If you already have the addin installed and configured, then jump straight to the section on usage further down the page. Download the addin file from the Indicia Downloads page and unzip it into a temporary folder, then install it into Recorder 6 as normal. This adds a new Indicia2Recorder menu item to the Recorder 6 Tools menu. Upgrades can be performed by simply copying the file to replace the older version of the addin, though this must be done when Recorder 6 is not running. Visit the configuration page for Indicia Mobil Auth via the menu at Site configuration > IForm > Mobile Auth Settings in order to configure an shared secret (app secret) which you will need later. Visit the configuration page for this module and specify a shared app secret (Configuration > Indicia integration > Indicia remote download settings. Use an existing connection configuration file. If you are the administrator of the website then you can create your own connection configuration file. You will need to obtain a file called indiciaConnection.txt for the website you are connecting to. This may be available from the website administrator. 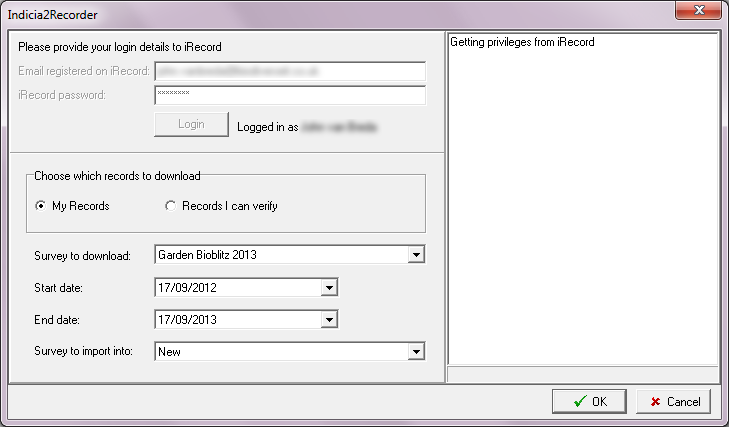 For iRecord, there is a connection file available from the Indicia Google Code Downloads page. Save this file to your Public Documents folder or personal My Documents folder in a sub-folder called Indicia2Recorder. The Site ID that will be used by Recorder 6 to identify records belonging to the remote site. Start Recorder 6 and access the addin via Tools > Indicia2Recorder on the menu. The addin will detect that the configuration file is not present and will ask you There is no configuration file available to define connection settings for the remote site. If you are an administrator wanting to create a connection file then please answer the following questions. Click OK and a popup will appear asking you to fill in the site URL. Fill in the full domain name of the site including http:// but excluding any trailing slashes or specific page details. If the website is operating in a sub-folder, include that subfolder in the URL. For example, you might specify http://www.mysite.com or http://www.brc.ac.uk/irecord. Click OK and a further popup will appear asking you to fill in the Shared App Secret of the application. This setting is defined on the Indicia Mobile Auth settings page (under Site configuration > IForm > Mobile Authentication). You need to click the link to add a mobile application and fill in the form fields and save it. One of the fields is called Shared Secret. Copy the shared secret into the popup in Recorder 6 and click OK.
A further popup will appear asking you to fill in the Site ID for records to be created in Recorder. You should obtain a new Site ID for your remote site in the same way that you can obtain Recorder 6 site IDs, from Recorder resellers. It should be an 8 character string consisting of uppercase characters and digits only. Click OK and a final popup appears asking for the name of the site. This will be used to create appropriate labels on the addin’s dialog. Click OK when you are done and the configuration file will be created. Click OK and a final popup appears asking for the Drupal version - enter either 7 or 8. If you want to change the settings in your connection configuration, just delete the existing file from the disk (Public Documents or My Documents, the file you want is Indicia2Recorder\indiciaConnection.txt. Now restart the addin and it will guide you through creating the file again. During the import process, where a record can be attributed to a definite person (i.e. there is a link to a record in the people table), then the person’s ID will be used to create a unique local ID in your Recorder 6 database. However, in the circumstance that the person already exists in the Recorder 6 database, the addin cannot associate the records with the correct Recorder 6 NAME_KEY because a match on name alone is not guaranteed to be unique. There is also the circumstance where a name has been filled in against a record in free text, either in the Recorder or Determiner field. So, to allow these names to be easily resolved to known people in your Recorder 6 database you can create a file called knownPeople.txt in your configuration file folder. In this file put details of a person on each line, in the format surname,firstname=NAME_KEY. You can enter several permutations of a name on separate lines if required, e.g. to match the first name Dave and David to the same person. Note that where you are aware of 2 active recorders with a possible name clash, you cannot use this technique so may be best post-processing the data in Recorder 6 to resolve any issues. Indicia has the ability for each online recording survey to define attributes which extend the data model and it is possible to configure the import of attribute values into Recorder 6. These custom attributes can be associated with occurrences or samples and can capture any single piece of information. Custom attributes have a single caption property which describes them. You will need to be able to run queries against the Recorder 6 database in order to perform this configuration task. The measurement type - what are you measuring? The measurement qualifier - what exactly is the measurement of? Example 1 - An Indicia attribute called Count. In Recorder 6 this would map to type=Abundance, unit=Count, qualifier=Unknown (since we don’t have any information as to what was counted. Example 2 - An Indicia attribute called Count of Larvae. In Recorder 6 this would map to type=Abundance, unit=Count, qualifier=Larvae. Example 3 - An Indicia sample attribute called Surroundings linked to a termlist. In Recorder 6 this could map to type=Description, unit=Term, qualifier=Surroundings. So, before you can configure the addin to import any custom attributes from Indicia, you first need to decide which custom attributes you are going to import and you need to then create the required measurement types, units and qualifiers in Recorder to capture the data. You can do this via Recorder 6’s Tools > Termlists screen. Once you have done this, follow the steps below to configure the import. In your Public or My Documents\Indicia2Recorder folder, alongside the indiciaConnection.txt file, create a text file called config.txt and open it in a text editor. In this file, you can insert mappings from an Indicia custom attribute to a Recorder 6 measurement. To do this. start by typing smpAttr: or occAttr: for a sample attribute or an occurrence attribute respectively. Follow this with the ID of the custom attribute (read from the warehouse user interface screen which lists the attributes), then an equals sign. Now all you need to do is to paste the MEASUREMENT_UNIT_KEY after the equals sign, then add a comma and finally paste in the MEASUREMENT_QUALIFIER_KEY. Repeat steps 2-4 on a new line for each additional custom attribute then save it. Find the Indicia name of the attribute you want to map values for. This will be one of the keys in your config.txt file, e.g. occAttr:314 for the occurrence attribute with ID 314. Create a file in the Public or My Documents\Indicia2Recorder folder, alongside the indiciaConnection.txt file, with the same name as your Indicia attribute but without the colon and with TermMappings.txt appended, e.g. occAttr314TermMappings.txt . Save the file and Indicia2Recorder will map the values next time you import. Any values not in the mappings file will be imported in their original form. To use the addin, you will first need a login to iRecord. A standard login will allow you to download your own records only, but if you are an LRC or verifier then you will be able to download records within your area or iRecord expertise settings respectively. Currently sensitive records are excluded from the download. Click on Tools then select the Termlists menu item. In the Select List box, choose Survey Type. Check if Indicia appears in the list of terms. If not, then continue with the following steps. In the Short Name box, type Indicia. Once you have the survey type setup, you can create a survey and set the Survey Type to Indicia, ready to import records into. In Recorder 6, start the addin by selecting Tools > Indicia2Recorder from the menu. The first step required is for you to fill in your email address that you registered on the Indicia website with and your account password, then click Login. The addin will then connect to the Indicia website and check your access rights. It can then populate the various options for what you are able to download below. Once logged in, you simply need to select whether to include your own, your verification or your LRC records (if available), the survey on the Indicia website you want to import records from, the date range, and the target survey then click OK. The addin will do the rest. Click the Cancel button to close the dialog when you are finished. In your Public or My Documents\Indicia2Recorder folder, alongside the indiciaConnection.txt file, create a text file with a name that describes the batch of surveys and with a suffix .batch and open it in a text editor. Now, the file name of the batch will appear in the list of surveys available to import - if you pick this survey and import it, the batch file will instruct Indicia2Recorder to import the full set of surveys you have configured. When you download records from an Indicia website using this addin, as long as other Recorder 6 users doing the same use the same connection configuration file then their downloaded records will get the same NBN Keys as the ones you download. Therefore these will be understood by Recorder as the same record and if you exchange data with other Recorder 6 users it will not create duplicate records. This also means that you can download a set of records multiple times and Recorder 6 will not create duplicates - subsequent downloads will overwrite the existing records. This means that if any record changes are required, making them on the top copy in the Indicia dataset then downloading into Recorder 6 ensures that changes are available to other Recorder 6 users. © Copyright 2014, Indicia Team Revision 56525bb0.